Dancer, Teacher Sephora Germain is a soloist of Ayikodans, Haiti's world-class professional dance company founded and directed by Jeanguy Saintus. Since infancy, Sephora found joy in moving her body and expressing herself through Haitian popular dance forms but began professional dance studies years later, as a young adult. From 2006 to 2009, she first took formal dance classes at the Haitian dance school Bazilik Kreyol, and gained performance experience with the school's troupe. In 2011, she was promoted to a full-time position in Ayikodans, the school's professional contemporary dance company. Since, she has performed as an Ayikodans soloist at festivals and in major venues in Haiti, the Dominican Republic, Barbados, French Guyana, the United States, Switzerland and Sweden. She is also a teacher who instructs dancers of all ages in Haiti and elsewhere. Her classes engage how Haitian dances called "traditional"--to mean, stuck in time and space--have always developed with their time, space, environments and interpretors. 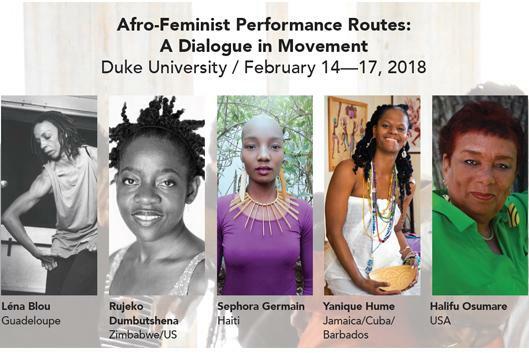 Her dance pedagogy invests in a vision of Haitian dances that pays homage to the cultural and religious roots of national dances as she directs attention to how these dances been always been contemporary, and attempt to create spaces free of gender, sexual, race and class discrimination.